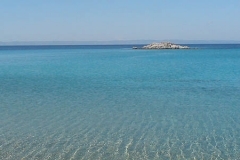 Another beautiful beach in Halkidiki, 5km south of Nikiti. It is a long beach that is famous for its white sand. 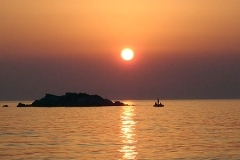 A characteristic landmark is the little rocky island off-shore. It is easily accessible by car. 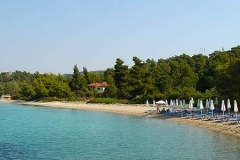 Facilities are located mainly in the north part of the beach where there are sun-umbrellas and a beachbar. Certainly, the beach is free to enter. You will pay only if you use an umbrella or a sun-bed from the beachbar, however there is plenty of space to put your own equipment. You may easily swim to the rocky island. Water is relatively shallow. The beach is easily accessible by car. Nevertheless, finding a parking place is difficult in peak hours. Therefore, you’d better go early in the morning or in the afternoon. The water is shallower in the south part of the beach, so if you have little kids, prefer it. Keep the beach clean. 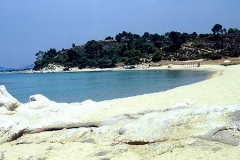 It is almost impossible for the authorities to keep clean all the beaches in Sithonia when visiting by so many people. Good. Prefer the south part of the beach. You may park your car by the beach road. The sea is just a few meters from there.